There are moments when pure joy is a part of my day, but it doesn't seem to last long. I've always wondered why it didn't. Over the years I've realized many times I've prevented myself from a continued enjoyment of those moments. "But why?" I would always ask myself. The only thing I could come up with was I may not have believed I was worthy of happiness, and so, found ways to ensure that it was short-lived. 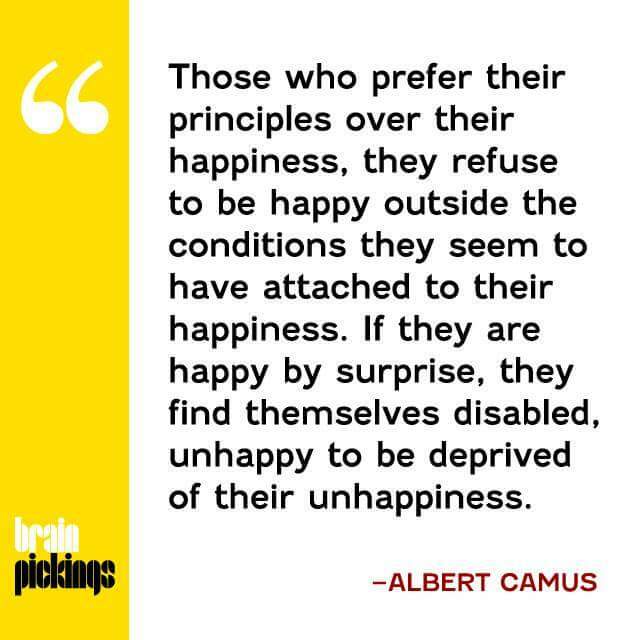 After reading this quote by Albert Camus, I had to rethink that. My inability to sustain happy moments or my subconscious wish to cut my happiness short may really just be my nature. I'm a very empathetic person, as well as having an activist bent about me. This, quite possibly, keeps me thinking I can't have prolonged happiness if those around me aren't experiencing it. The self-sabotage may be subconscious guilt. It's odd. 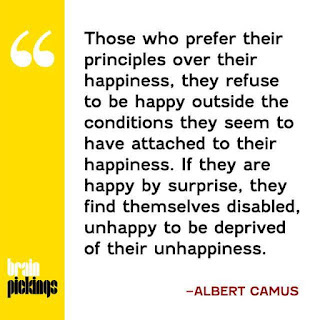 Discovering this one thought written by someone long ago, before I was born, has the power to change how I will perceive and react to future happiness. But finding it may also be a wonderful gift to me.